Astrophotography is one, if not the most interesting and challenging fields of amateur astronomy. It is the appealing concept of recording the images of deep-sky objects at distances so great that the light left the object long before the formation of our planet. 103a-O), hypersensitized Kodak 2415 as well as several colour films for imaging the moon and planets. At this stage I built several telescopes that were housed in two different observatories. Most of the images were obtained with two Newtonian reflectors (300mm f/7.1 and 222mm f/5.8). Both had German equatorial mountings equipped with high precision gears in both axes. Good results were obtained with these instruments, but imaging galaxies and nebulae (my main targets) meant that I had to perform long exposures of of several minutes or even hours. I had to overcome all the problems that arise when dealing with this (bad polar alignment, flexure of the guide scope, bad guidance...). Eventually good results were obtained using emulsions but progress was slow and not many different objects were imaged. Enter the CCD revolution and digital astrophotography. CCD cameras have been available to amateur astronomers since the late 80's with the introduction of the SBIG ST-4. CCD detectors have high quantum efficiency (they can record up to 90% of the photons that strike them, and even more in professional systems) and exhibit a very good linearity (their output is almost directly proportional to the number of incident photons- there is no reciprocity failure as found in long exposure emulsion based astrophotography). This means that images of deep-sky objects can be obtained in a few minutes and the output can be processed using standard image processing techniques. Several different types of CCD cameras are now available. Many considerations have to be taken into account when deciding which camera is the most adequate for your specific work. In 1994 I bought a HISIS22 CCD camera equipped with the KAF-0400 chip. It has 768x512 pixels, 9x9 microns, which provides 6.9 X 4.6 mm photosensitive area. I bought the version with an anti-blooming system (KAF-400L) because I was interested in obtaining results with near photographic quality (this means that sensitivity is reduced by about 30%, not a very high price to pay). This chip is of the Multi-Pinned Phase type meaning that the dark current will be 10 times weaker than other CCD's. The actual noise level amounts to only 12 electrons. A 14-bit analog-to-digital converter produces images with 16,384 intensity levels. 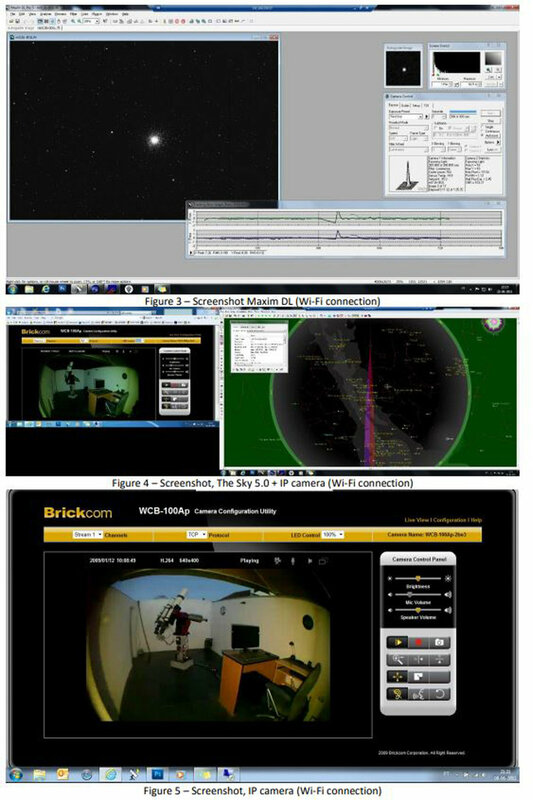 In 1998/99 a ST7 CCD camera a MX916 CCD camera and an Audine CCD camera were added. I also bought a C14 equipped with a fixed pier and a Byers retrofit in 1989. I used this instrument and a Mead 2045 mounted piggyback for Deep-Sky CCD imaging with excellent results. The accuracy of the Byers drive was very high. It consisted of an ultra-precision 230mm 359-tooth gear with virtually no detectable periodic error (less than 3 arc seconds). The original C14 drive showed very erratic tracking with typical periodic errors of up to 120 arc seconds meaning that long exposures required constant corrections. Thanks to the installation of the Byers retrofit CCD imaging was easily achieved with a minimum guiding effort. In 2005 I acquired a Paramount ME german equatorial mount that was installed on Pier Tech 1 telescope Pier. • Research-grade 11.45-inch right ascension and 7.45-inch declination gears drive the Paramount. The right ascension gears guaranteed to have 5 arc seconds or less peak-to-peak periodic error. • Perform a DDP-style stretch on the combined image (Don't do any sharpening as part of DDP).